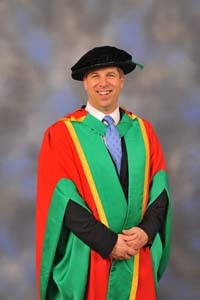 Honorary Degree of Doctor of Laws in recognition of his significant contribution to the legal profession, and his commitment and support to legal education and access to justice. In 2015, Jonathan Smithers took over as the 171st President of the Law Society of England and Wales, representing over 160,000 solicitors practising in over 100 jurisdictions around the world. He graduated from Nottingham Trent University 31 years earlier, having completed a law degree and then the Law Society Finals course. He joined Cooper Burnett solicitors, Tunbridge Wells, where he has been employed since graduating. Jonathan became a partner just a year after qualifying as a lawyer, an indication of his talent and dedication. Jonathan is nationally recognised for his expertise in land law in which he has practised for over 30 years. He has strongly promoted and supported social mobility and equality in the legal profession and provided high profile support to legal and community charities. Through the knowledge he gained via his studies at Nottingham Trent University, his drive, talent and commitment, he has made a real difference not only to the law and legal profession but also to ordinary people seeking justice in England, Wales and abroad.